This article was posted on 21st October 2015. It's that time of year when our inner clocks tell us it's time to start battening down the hatches, get cosy and snuggle up; log piles are stacked high as wood burners are fired up and thick wool socks are layered on for pulling up the wellies. It's Autumn that jump starts our desires to get cosy, but why is it that "cosy" has become synonymous with dark, small and crowded? Therein lies the challenge, making sure your otherwise stylish home does not succumb to the negatives associated with the word, but instead take "cosy" back to its roots "giving a feeling of comfort, warmth, and relaxation". Cream Hat; Black Jumper; Iceland Merino House Socks; Grey Biker Jacket. Getting cosy should be about stylishly embracing the desire to hibernate - about making your home as comfortable as possible throughout these more disagreeable months ahead, and we don't know about you, but to feel truly relaxed in our surroundings we need some sort of semblance and style - as well as a crackling fire, a large hot choc and our favourite scented candle. With the use of warm lighting, soft rugs underfoot, fluffy blankets, slubby throws and a puffy duvet - the transformation into Winter needn't be a huge overhaul but more of a gentle flow into the new season scented with pine, wood smoke and mulled wine! We've compiled our perfect Interiors Cosy Kit... less the obligatory purring cat! 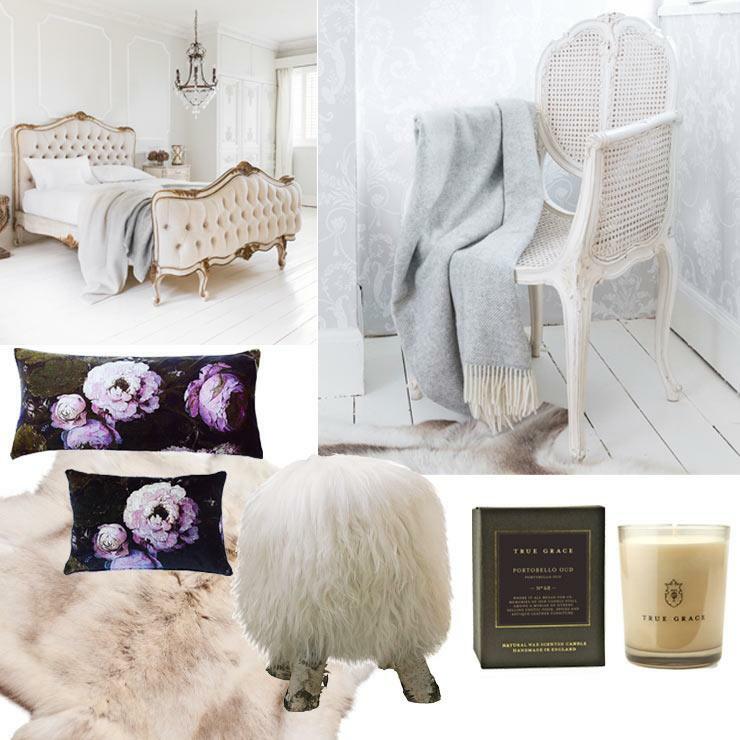 Palais Avenue Bed, £1880; Provencal White Rattan Chair, £252; Grey Lambswool Herringbone Blanket, £80; Floralism Cushions, from £35; Arctic Reindeer Hide, £195; Dolly the Stool, £220; True Grace Candle from £25.